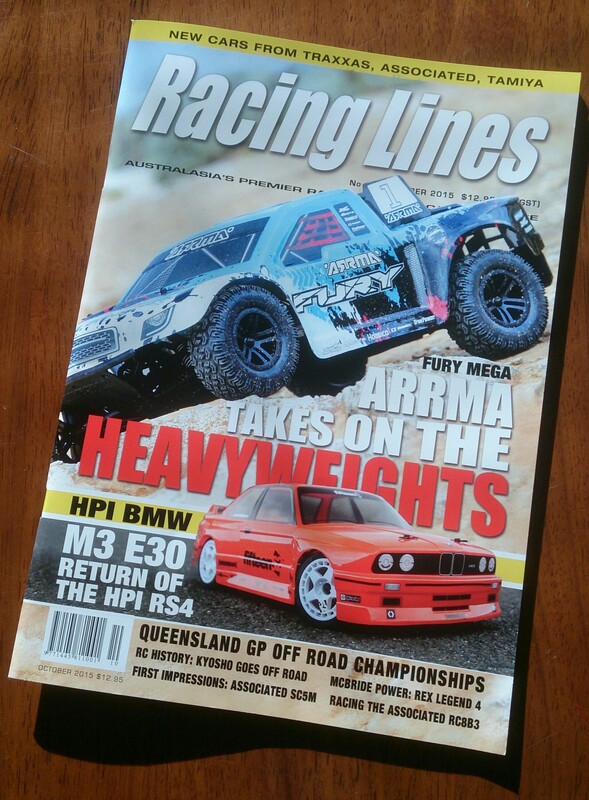 Racing Lines 248 out now! The May edition is out, and it’s not bad. Let’s have a look inside. Auto Alley looks at Al the latest releases, interestingly quite a few on road releases this month. Quads and drones flies the LRP gravity vision FPV. Second look re looks at the Kyosho Dodge pair of cars, and to be honest, it seems to add nothing much to the original review so I was left a little confused there. 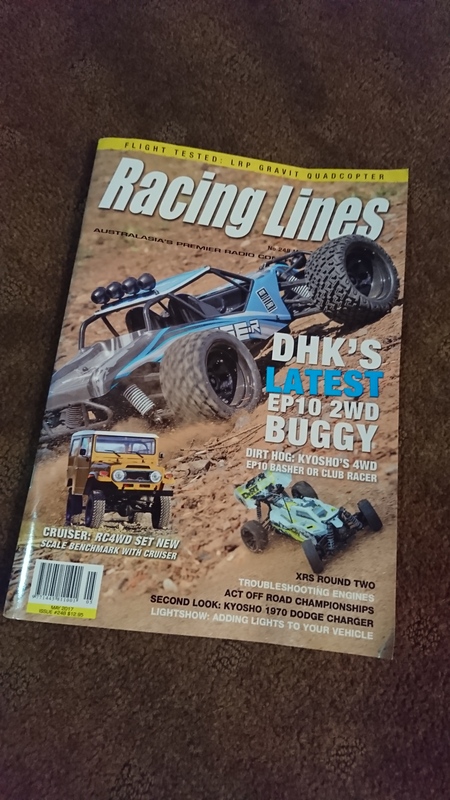 Ray Wood reviews the budget Kyosho Dirt Hog as well as the DHK Cage-R 2wd buggy. 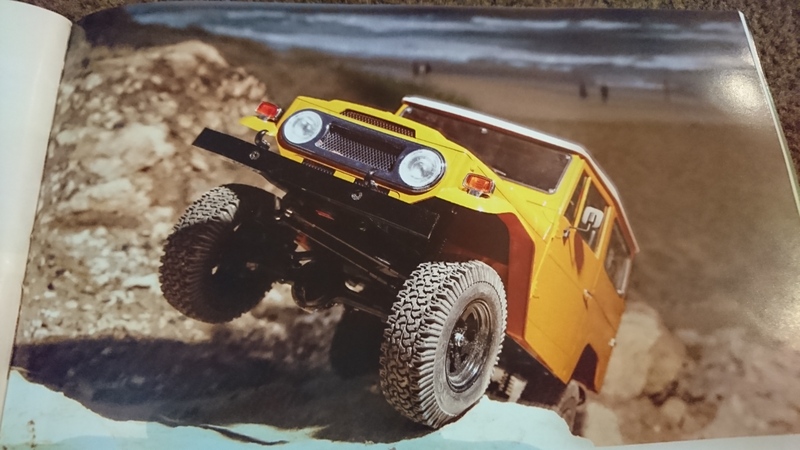 Christian Brunelli reviews the RC4WD Gelande II Land cruiser. I liked the review, however the exceptional photography really does the vehicle justice and makes me, a land rover man, want this Toyota. Racing lines has all the latest results and race reports including one from yours truly. If only I had made the results in a better than passing mention. Yes it’s on the shelves at good newsagents once again, and here is the wrap on what you will find within the pages of the magazine this month. There is a few different articles in this edition which is always interesting to read. Auto alley has the latest news on the Team Associated F1 Car & T4.3 RTR, the Traxxas Ford GT & new Rally car, HPI Savage XL Flux Y Kyosho 1970 Chevelle SS. Chris Lander has also penned an interesting piece on what spare parts to carry for your car. 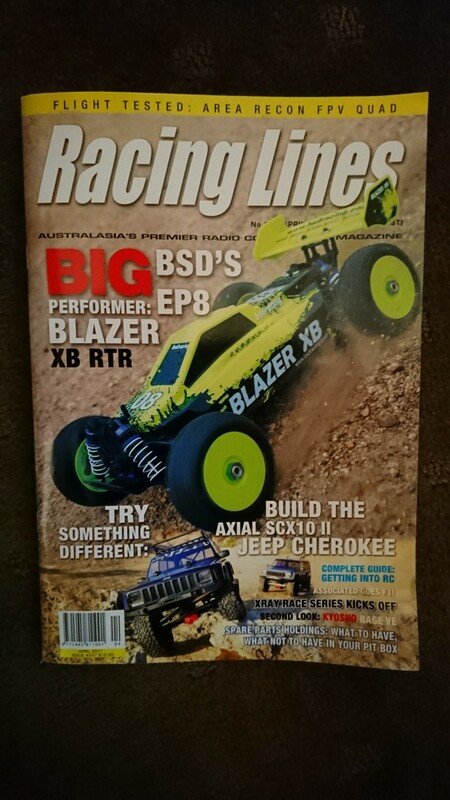 There is a great article on building the Axial Racing SCX10 II Jeep Cherokee, being built by an 8 year old to boot! Racing Lines has all the latest event news, reports and results. Yes it’s hitting the shelves already and it is a great edition to round out the year with. Auto alley has all the news on the latest releases including a couple of interesting cars from Haiboxing. Not everybody’s favourite brand exactly, but the Volcano monster truck and EP6 Dune buggy are itneresting additions to their lineup. Dirty Deeds ooks at GP off road clutch tuning (Actually I didn’t know that there was such a thing!). How to looks at getting soldering right, always good to get some hints and tips there. Quads and drones has a look at hte differences between RC car racing and quadcopter racing. Reviews is my favourite area, and an in depth review of a number of vehicles can be found including the impressive looking SCX10 II (I want one! ), the Helion Four 10TR, and of cours the enormous Traxxas X-Maxx. Racing news looks at the results and reports from all of the latest racing around australia to round out an excellent issue. Yes the November edition of Racing Lines should be on your local newsagent stands NOW!!! What will you find within these hallowed pages, well lets have a look! Auto Alley news looks at the Turbo Scorpion Re Release from Kyosho, as well as their electric motorcycles and Lazer ZX6.6. The Traxxas Bigfoot, Associated TC7.1 FT RC4WD EP18 Gelande II D90 RTR (Small Land Rover Defender Crawler, awesome!) and even a look at the ready to fly Kyosho Drone Racer which looks interesting. Second look glances back at the ARRMA Kraton to see how it has fared over time since February 2015. Also being reviewed is the BSD Racing Dune Racer, a vehicle I like the appearance of I have to say, and it looks like it performs well too. 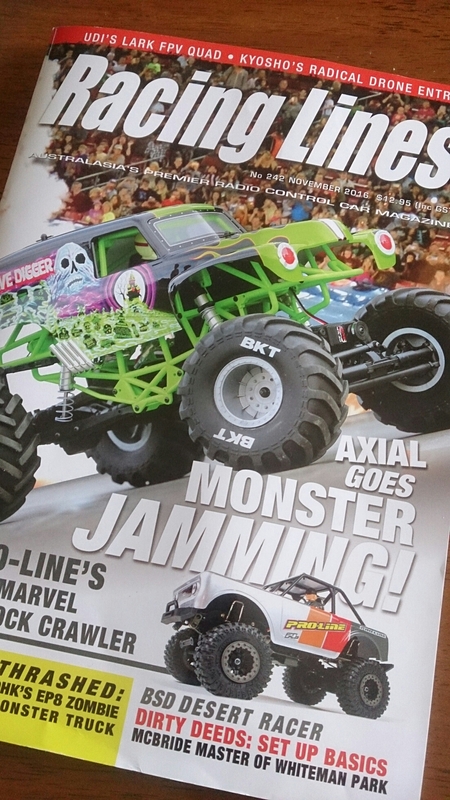 And for their Fourth review in a single edition, the Axial Racing SMT10 Grave Digger, somebody give me one of these to review as it looks great! I think Axial are onto a winner here. Racing News holds all the latest news and reports from all the latest Aussie races. Yes the October 2016 edition of Racling ines is out. 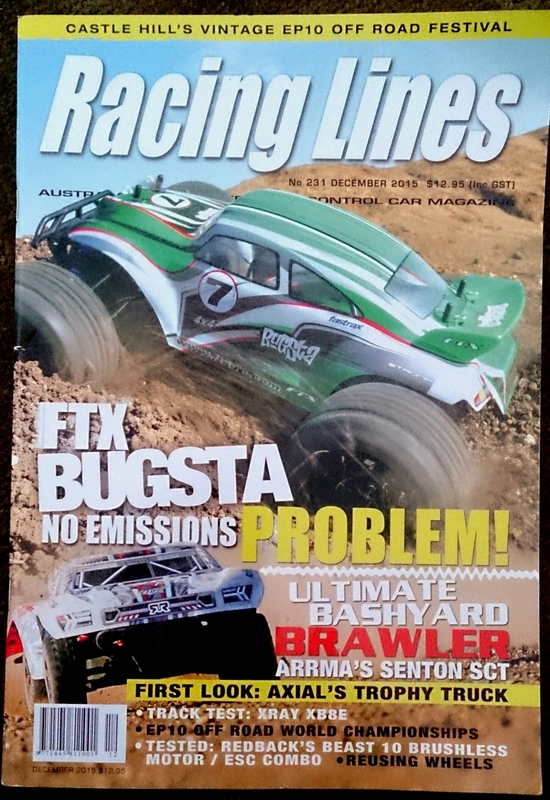 Here is a look at what Aussie goodness you will find between the covers of this month’s edition. Auto Alley (news) looks at the Thunder Tiger Bush Master RTR and breaks news of the new X-ray XT2 Stadium Truck that has performed very well in the recent EOS race series. It also looks at some of Team Associated’s latest small scale offerings as well as prolines new Mini Rock Crawler. Second look re examines the Helion Four 10SC RTR which has recieved some new gold bling hopups which seems to be taking it’s punishment well. Quads and Drones look at the Traxxas Aton, something I have been interested to see some direct feedback on. The Air break feature is an interesting on that will be of great help for those trying out the Expert mode on the Aton that’s for sure! and all in all it looks the goods. There is a second look here detailing a crash between the Aton and a camera quad after teh initial review, and let’s say the Aton survived, and stayed airborne in less than desirable conditions! RC History examines the history of one of the big names in RC, Traxxas. In the reviews DHK’s Optimus XL gets a shakedownby Chris Lander. Rau Munday looks at the Team Associated B6Din details and tests the vehicle. Christian Brunelli gives the Helion Intrusion XLR Monster truck a bashand seems very impressed. Personaly I am very impressed with Helion as a whole from what I have been reading and experiencing myself. And of course Racing Lines has all the info on upcoming races, race results and reports from around the country. Racing Lines No.231 out now! Yes the December edition of Racing Lines has hit the shelves, and this is what you can look forward to! The Team Associated RC10 in the Smithstonian! Another month, another exciting Racing Lines, issue 229. This month we have the usual range of articles, and some great reviews of some great vehicles. Testbench works on the Rex Legend 4 from Novarossi as well as gives it a spin at the 2015 Queensland 1:8 off road champs. Testbench also fits the Associated Pro Rally with the Associated XP LED light set and the ESS One engine sound system. Racing News looks at a range of racing activities, meets and results as usual. So another bumper edition which should be on news stands NOW!